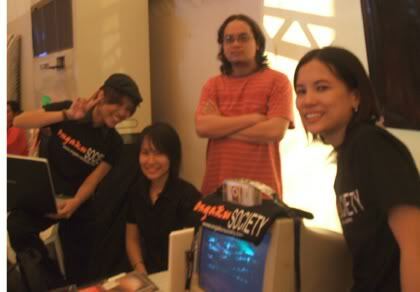 OngakuSociety, the premiere contemporary Japanese music community for Filipino fans, was also present at the 2007 Nihongo Fiesta last Saturday. Aside from manning their booth, the OngakuSociety bigwigs also hosted a mini quiz show where they gave away OngakuSociety shirts. I was going to run up to the microphone and answer myself (even if I had to trample on some poor kid to do it nyahahaha! ), but I had to maintain a more dignified persona (which was even a meaner feat, come to think of it…). Anyway, the OngakuSociety is going to hold great events this year including the upcoming Ongaku Rewind on the 28th of April. The gals (and guy) of OngakuSociety pose prettily (and astig-ly) for the cam. 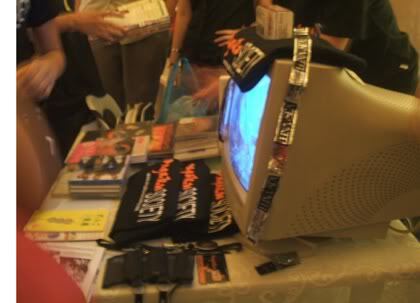 See that orange iPod on top of the monitor? Wanna get that sweet, sweet freebie? Please visit their official site for the ongaku details. Lovely to meet you at the Nihongo fiesta! Hello, Hazel and Ria! Thanks sa pag-visit, and of course we will be there! More power sa OngakuSociety! cheers and more power to SUGOI STUFF! ate rotch, nakakahiya ang e-mail ko hehe 😀 thankies din!